Home Page of the author Emergency services at Manchester Airport were called out again on Wednesday when an ATP aircraft of British Regional Airways (a subsidiary of BA) had problems with its undercarriage on landing: As the pilot described, the nose wheel collapsed, causing the nose to hit the runway. All on board were evacuated using the chutes, and no-one was hurt, apart from one passenger who suffered minor injuries. The plane had just arrived from Southampton. An aircraft of the same type, the Advanced Turboprop, had a similar problem last August on landing at Manchester. The airline and the manufacturers deny that there's a defect in the plane. Two weeks ago, a Continental Airlines plane was evacuated at Manchester after a fuel leak. The Imperial War Museum may still come to the Manchester Ship Canal. Peel Holdings, owners of the Ship Canal and the new Trafford Centre, have pledged �m towards the �m project. Trafford Borough Council will put in a new bid for the museum. Last year's bid was rejected. And a spot further down the Canal, near the Trafford Shopping centre, nearing completion, may become the final resting place of the decommissioned Royal Yacht Britannia. The final proposals for the scheme were submitted today. Attractive new signs have been going up all round the Northern Quarter - that area of the city centre to the north and east of Market St and Piccadilly. They have a continental look, and feature enamelled tiles in blue and white. Is this an attempt to turn Manchester into the "Paris of the North"? I hope not. The Hallé Orchestra is to cut its numbers from 98 to 80 musicians. The Musicians Union have given their agreement to the reduction, which will occur through natural wastage, and save a quarter of a million pounds a year. A pub in Greater Manchester went up in smoke over the weekend. Kevin Farrel and his wife Pam and daughter Stephanie were unhurt after an explosion which destroyed the Bridge Inn, on Manchester Road. The incident occurred during the night. The explosion was apparently caused by a gas leak. I drove past the pub the next day - it was reduced, literally, to a pile of rubble. I decided to photograph, instead, the much more cheerful secne at the Fisherman's Inn, Hollingworth Lake. A baby was left in a police station in Collyhurst on Saturday night. The mother was subsequently located, and was in hospital, said to be suffering from depression. And in Warrington, police are still looking for the mother of an infant who was found dead near the Gullivers World theme park last week. There have been accusations that Manchester Cathedral is investing in the arms trade. Representatives of the Cathedral has 20,000 shares in British Aerospace. Cathedral say they are only supporting a local employer, but the Campaign Against the Arms Trade accuses them of supporting oppressive regimes. The Manchester-based Co-op Bank makes a point on its billboard ads around the city, that it doesn't invest in such regimes. There were glum faces at Old Trafford on Wednesday evening when Manchester United drew one all with Monaco. Monaco won on away goals, and so United's European hopes were dashed. I photographed the crowds going in but didn't stay for the match. As reported in "City Appointments" a free newspaper distributed on the streets of Manchester and Leeds, the draw with Monaco knocked �m off the club's stock market value. If you were in the Arndale Centre last week shopping for clothes or a Mother's Day present, you might possibly have had such questions in your mind as: "What existed before the Big Bang?" and "What is beyond the universe?" A display in Barbirolli Square, near the Universal Studios shop provides the answers. Interactive screens and experiments help you to understand the incomprehensible while you're looking for a pair of shoes or a Tweety Pie mug. Despite the subject matter, shoppers are showing plenty of interest in the exhibition, provided by Nuclear Electric and the Particle Physics and Astronomy Research Council. Perhaps the tourist office ought to do one with questions such as "Is there life beyond Greater Manchester?" and "What existed before the Hacienda?". A dreary, overcast week's weather was broken yesterday with a day of bright sunshine and mild temperatures. It's amazing how the fine weather brings people out into the open. 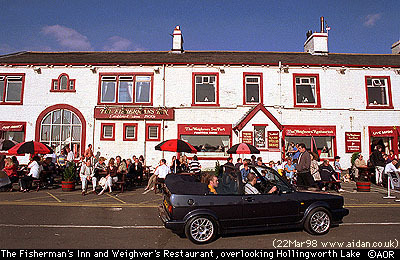 Hollingworth Lake, near Rochdale, was full of daytrippers enjoying the sunshine and savouring an afternoon pint next to the waterfront. But today it was back to cloudy skies and cooler temperatures. At least the nice weather came on a Sunday. It was a pleasant foretaste of the summer, which will soon be here. I noted your section on Victoria Park. I attended Xaverian College between 1940 and 1945. At that time I remember walking through the park from the street car service and in September picking up 100's of "conkers"
Did you know that the American forces had a barracks in some houses right across from the main gates, and oposite the Catholic church. We used to play them at cricket and baseball. Interesting times. I believe they were MP's. I have been visiting your site for a long time now, and really appreciate the work that is evident in your web pages. I'll include one of Xaverian, which I also attended (1969 -1976), soon. Are there any more ex-Xav's people out there? Connection with Manchester: Born in Sudall Street Collyhust in Nov 1930. Lived in Cheetham. Temple School. Heath Street School. Worked H & J Quicks. Attended Stretford Tech. What feature do you like best? : Guest Book. Where I found a lost Relation Right out of the Book, so to speak. Old photos. What could be improved? : Your doing a fine job. Requests for photographs: The Jewish Hospital. when I was young I lived in Herbert St. A German Bomb hit the Hospital and we all helped to get people out. Never been Back. I'm not even sure if the Jewish Hospital, or the building it was housed in, is still there. Can anyone help? I was born in C-on-M (Chorlton on Medlock, near the old Apollo/Hippodrome Manchester in 1938 and emigrated to the USA in 1957. I attended St. Pauls Church School, with a Miss Smith as Headmistress and Mr Crichellow as the Minister of the St. Pauls Church! Anyone out there remember that area? My maiden name was Hughes and I have a sister named Dorothy. I can't log on to the then and now link, any ideas? You have a cool site, keep up the amazing work! Sorry, I'll fix the link to "Then and Now" soon.